Other income declined 51% from $153.53 million to $75.77 million. Investments rose 151% to close at $1.06 billion (2017: $422.70 million). Income from commissions amounted to $55.88 million a 12% increase compared to the $49.76 million reported in 2017. Property income amounted to $2.07 billion, up 16% year over year. Operating expenses amounted to $1.69 billion for the year ended December 31, 2018 (2017: $1.48 million), 15% more than its total a year prior. Operating expenses for the quarter increased 14% to close at $487.32 million (2017: $426.21 million). 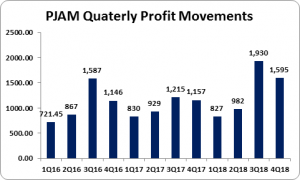 Consequently, operating profits increased by 66% to a total of $1.55 billion relative to $937.86 million a year earlier, while for the quarter operating profit declined 78% to $87.24 million (2017: $394.94 million). Finance costs for the period rose by 4%, amounting to $624.37 million compared to the $599.92 million for the comparable period in 2017. Profit before taxation increased 33%, closing the period at $5.67 billion (2017: $4.27 billion). This was due to a gain on disposal of an associated company of $47.31 million. Share of results of associated company climbed 19% to $4.70 billion relative to $3.93 billion in 2018. Following taxation of $311.08 million (2017: $79.33 million), net profit amounted to $5.36 billion (2017: $4.19 billion). Net profit for the quarter amounted to $1.60 billion compared to $1.18 billion booked in 2017. Net Profit Attributable to Shareholders for the period amounted to $5.33 billion a 29% increase relative to $4.13 billion recorded in 2017. As at December 31, 2018, PanJam Investment Limited (PJAM) had assets totaling $45.87 billion, a 17% increase relative to $39.35 billion a year prior. The growth was attributed to an increase in ‘Investment in associated companies’ and ‘Financial assets at fair value through profit and loss’ which amounted to $26.35 billion (2017: $24.92 billion) and $6.59 billion (2017: $1.06 billion) respectively. Shareholders Equity amounted to $33.73 billion (2017: $30.53 billion) with a book value per share of $31.64 (2017: $28.63).